Ciena (CIEN) posted a yet another set of blockbuster earnings last week. The networking platforms provider beat the Street’s estimates along with its own guidance once again. While there were a few dull moments during its conference call (like Waveserver sales coming in flat sequentially), the consistent growth of its largest segment, Networking Platforms, presents a particularly bullish outlook for long-side investors. Anyone closely following the optical and packet transport industry would know that Ciena has grown rapidly over the past 5-6 years. The networking stalwart has steadily gained market share since 2012 and its management has been making a deliberate effort to diversify its customer mix in a bid to reduce the cyclicality in its business and to unlock new growth opportunities. 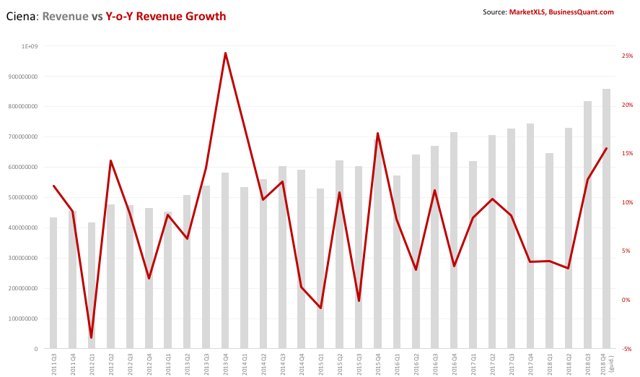 Ciena’s latest Q3 earnings report only goes to show that, contrary to what the bears might think, its growth story is still very much alive. The networking stalwart posted revenue of $818.8 million which is up 12.4% on a year-on-year basis. Not to mention, the sales figure was actually about 3.5% higher than the Street’s forecasts along with its management’s guidance. This outperformance is the sign of a thriving business. But that’s just the past. The company’s management noted during the Q3 earnings callthat their Q4 revenues would be in the range of $845 million to $875 million. The mid-point guidance figure implies a substantial 16% growth on a year-on-year basis. The chart attached below should put its growth trajectory in perspective. 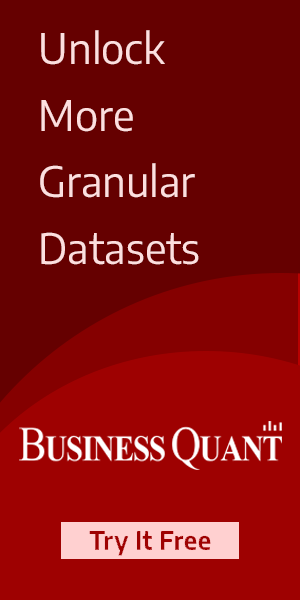 It’s quite evident that the company’s growth rate is guided to accelerate going forward. A dull moment for Ciena longs came when management announced during the earnings call that Waveserver sales aggregated to $253 million year-to-date. 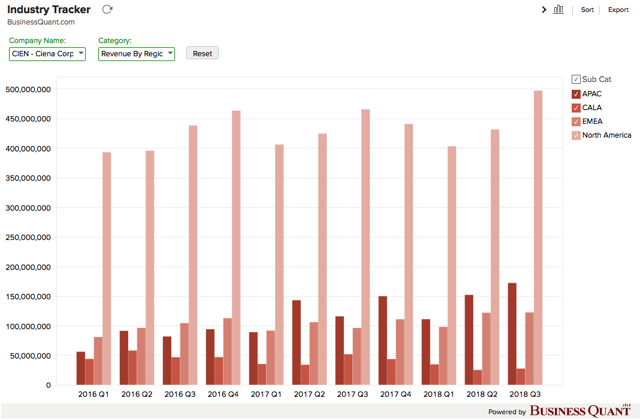 If we segregate these sales on a quarterly basis, then it’s evident that Waveserver sales were more or less flat sequentially. Now, this isn’t necessarily a red flag; the 9-month sales figure of $253 million is actually substantially higher than the $110 million figure for the entire FY17. Management didn’t elaborate on why these sales were flat and it might just be a cyclical event. But this is something that Ciena investors should be aware of. With that said, let’s take a look at the chart below. It provides a breakdown of Ciena’s growth in its recent quarters. Speaking of Q3, its Global Services division posted a sales growth of 6.4% on a year-on-year basis while sales of its software and related services segment declined by about 2.4%. 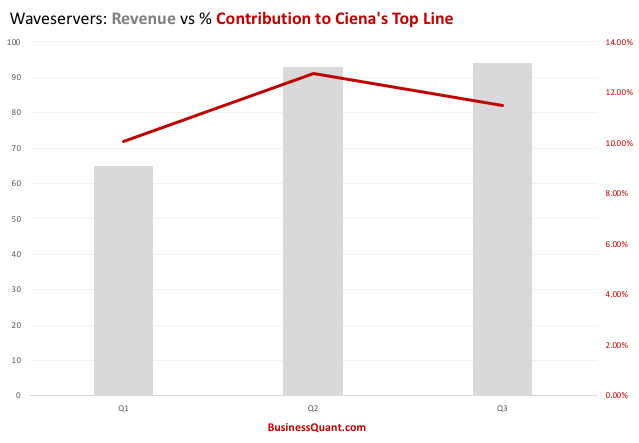 But as the chart below would indicate, neither of these two segments represent a sizable portion of Ciena’s total sales and, so, fluctuations in their sales didn’t have a material impact on the company’s overall revenue. 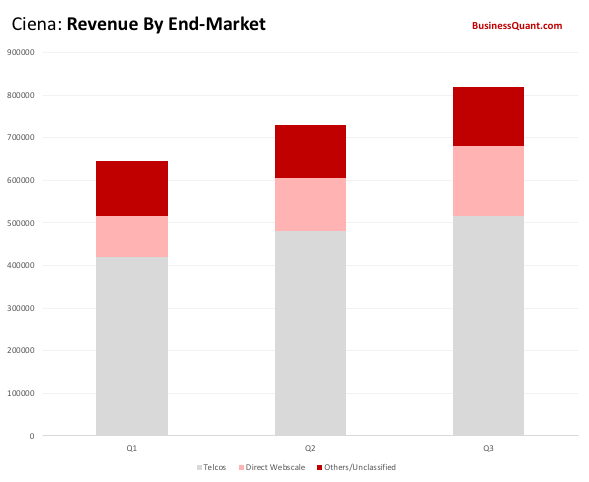 One thing that clearly stands out is that Ciena’s largest segment in terms of sales, Networking Platforms, was responsible for the bulk of its sales increase in Q3. This goes to show that Ciena’s core business (arguably) continues to do well and it projects a particularly encouraging sign for long-term investors. Overall Ciena’s management has been making a conscious effort to diversify its customer mix by rolling out competitive products for non-telco markets. Just to cite one example, its Waveservers are designed for web-scale workloads and about 96 customersare using the platform already within 3 quarters of its launch. Speaking more on diversity, the company has been able to grow its revenues across major geographies in a balanced manner. It’s not like Ciena experienced a spurt of sales growth in a particular region because of some regional catalysts. Rather, its sales have increased in all four of its geographical segments. I suppose this is another sign of a healthy company. It goes to show that Ciena’s product portfolio is attracting willing buyers across the globe in spite of low-cost competition from China, Japan and any local players that may exist in the aforementioned geographical regions. Its acquisition of Packet Design was completed only in July. This means that the financial impact of the buyout will fully start reflecting in Ciena’s books starting with Q4. Unfortunately, management hasn’t revealed the size and scale of these potential cash inflows. Also, Packet Design was already a solution partner for Ciena prior to its acquisition and it provided a myriad of customers with network performance management software and services. I suppose integrating it with Ciena’s Blue Planet platform can bolster the attractiveness of the latter for potential customers. The buyout of Packet Design might as well unlock new cross-selling opportunities for Ciena. Also, Ciena has been securing footprint deals with new customers with each passing quarter. This move diversifies and bolsters its revenue stream. Also, it opens up the possibility of these new clients ramping up their purchases down the line, once their partnerships with Ciena mature. After all, enterprise clients tend to ramp purchases gradually in phases once they start seeing signs of successful integration without any material glitches, performance issues or downtime. Ciena’s management is forecasting market share gains of about 200 basis points globally for this year as well. Any share gains in the fourth quarter are bound to bolster the company’s overall sales. Also, looking further into FY19, there is no reason to suggest that Ciena’s market share gains will suddenly come to an absolute stop. Given its recent trend, it’s rather likely that the networking stalwart would grab more market share from its peers in 2019. So, that might as well boost the company’s sales going forward. …we anticipate by the end of the year to have gained something like 2% market share, globally, on the back of this performance. 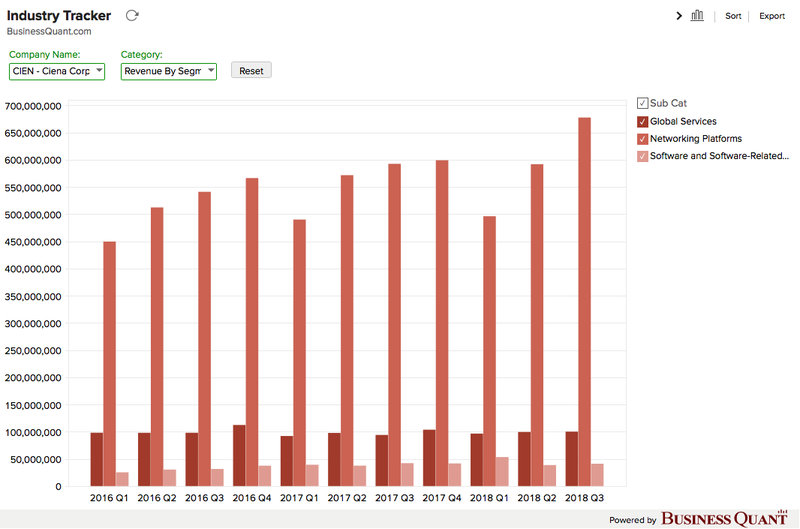 Ciena has been securing new footprint deals with each passing quarter, posting sales growth in all of its geographical regions and it continues to meaningfully penetrate the web-scale market. All this is bound to eventually boost the company’s revenues and reduce the cyclicality in its cash flows. Therefore, in the end, investors should be quite pleased with Ciena’s growth trajectory and its Q4 guidance. I believe this is a good time to be bullish on the company.